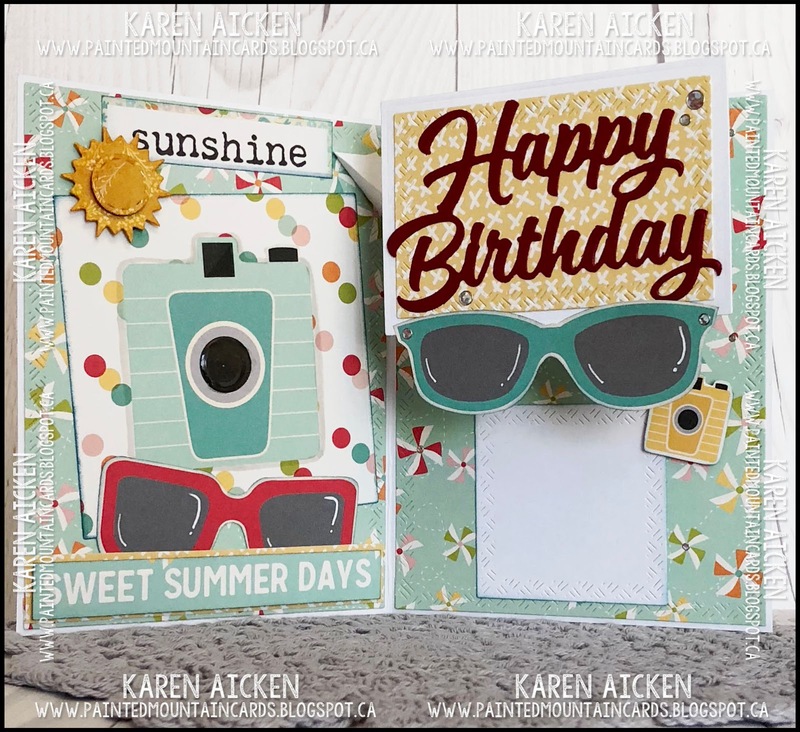 Welcome to the July Designer Challenge - this month Karen Burniston's theme for us is "Sweet Summer". This card took on a life of it's own as I was making it. I started with some new 12 x 12" papers that I picked up - there were two sheets of Cut-Aparts. I had to buy two of them as there were really cute 4x4" designs on both sides of the paper and I couldn't decide which side I liked best. So I bought two sheets and used both sides! The first thing I did was cut each 4 x 4" panel from the sheets. The one for the front of my card had the words 'Just add H2O', so I carefully cut each word into a rectangle. 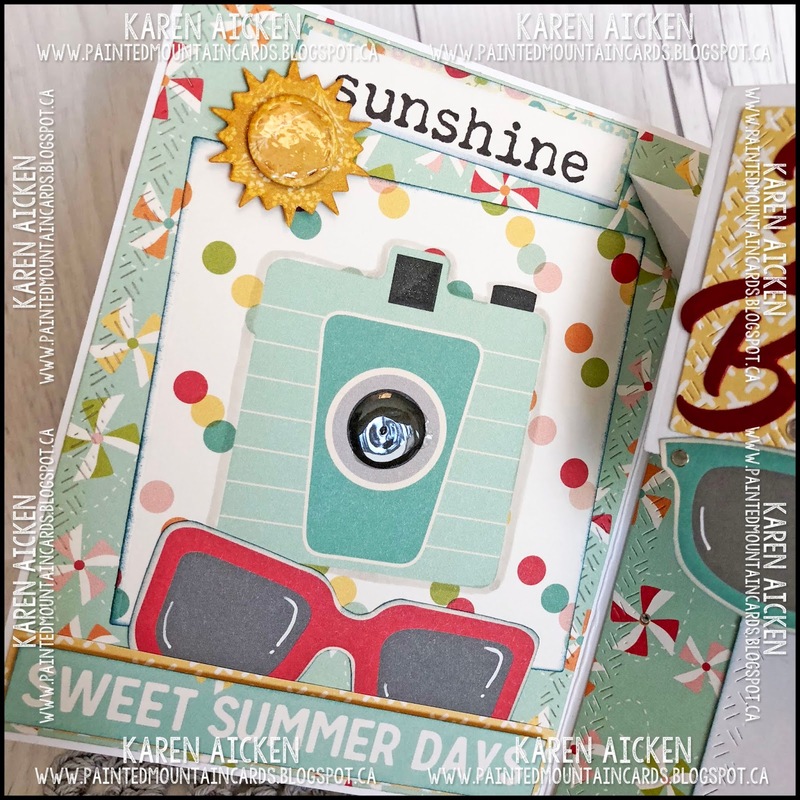 I nested one of the Crosshatch Squares inside a Crosshatch Rectangle, to cut a sort of 'Polaroid' frame, as my first thought was to make the front a shaker card. 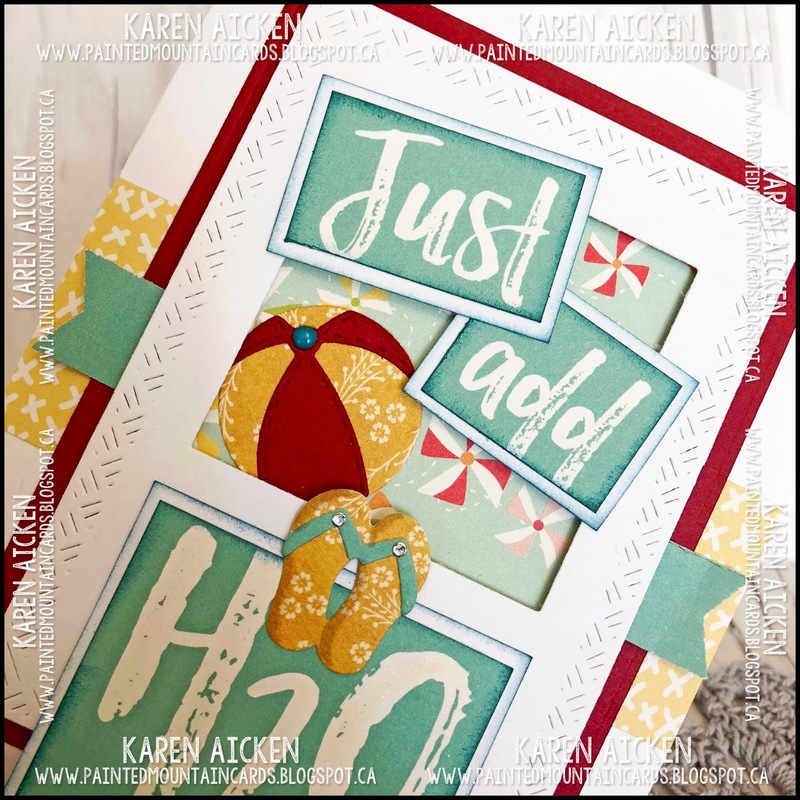 Instead I layered the cut out words with a couple of the Beach Charms cut from coordinating colours and patterns. Even though it's a Pop-Up card, it folds completely flat for mailing! Inside I used the Katherine Label Pop-Up to animate the Happy Birthday Rectangle, and adhered fussy cut sunglasses to the bottom edge. A second pair of sunglasses was cut from another one of the 4 x 4" Cut-aparts and adhered with the camera Cut Apart on the left side. The 'Sunshine' word was cut from the label strip on the patterned paper I liked the font. Nothing went to waste from these sheets! 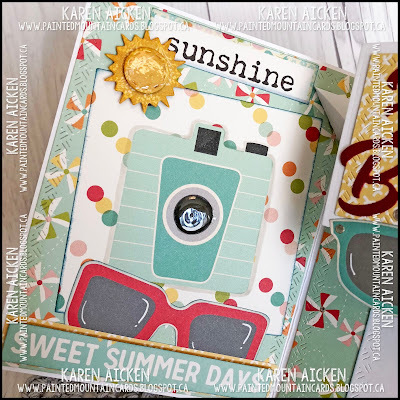 The sun is from the Tropical Scene die set, and I added some glossy accents to it and the camera lens. 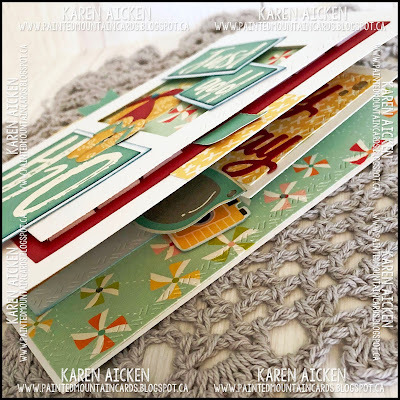 You get so much dimension from the Katherine Label Pop-Up and you can add all kinds of things onto the pop-up arm. 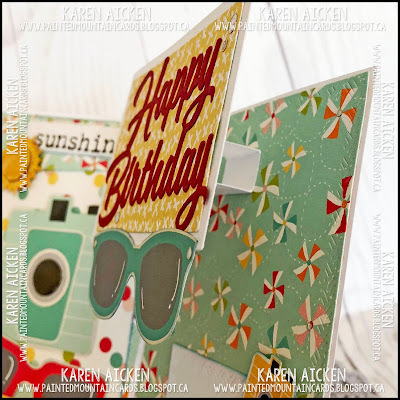 I hope you will check out the rest of the Design Team - their blogs are linked on the right. 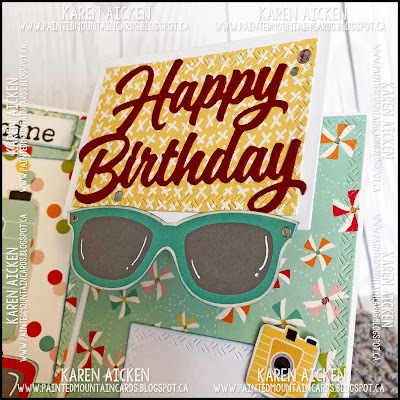 Tomorrow (Wednesday) Karen Burniston will have her project on HER BLOG and you will want to check that out as well. 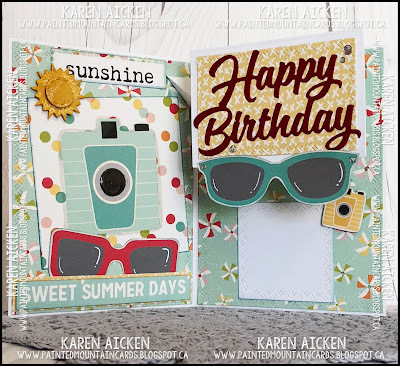 such a fun summery card, love those sunnies!